Need something nifty for the big game? Want to be get away from the predictable Cheez Whiz, tortilla chips and salsa? Let them eat pretzels! And not just any pretzels, but ones you make yourself. Easy as can be, these pretzels are delicious and a great way to get a Super Bowl party going! Let everyone make their own from the dough you create in your food processor, stand mixer or by hand. Put these together with a platter of assorted cheeses, marinated artichoke hearts, olives and cold cuts like salame and ham and you got it made. In a large bowl or stand mixer combine the water, yeast and sugar and allow to sit for 5 minutes or until foamy. Add 4 cups of the flour, salt, butter and olive oil and mix with dough hook or by hand until the mixture is well combined and moves around the blade and begins to form a ball. Transfer the dough to a large oiled bowl and cover with plastic wrap and allow the dough to rise until doubled in size, about an hour. Preheat the oven to 450 degrees F. Line two baking sheets with parchment paper and set aside. When the dough is risen, punch it down and divide it into 12 equal pieces. Roll each piece of dough under the palms of your hands into a 24-inch rope. Make a U-shape with the rope, holding the 2 ends of the rope, cross them over each other twice and press them into the center of the bottom of the U in order to form the shape of a pretzel. Place on the parchment-lined pans, spacing them about an inch apart. Bring the water and the baking soda to a rolling boil in a soup pot or large saucepan. Use a wide face spatula or skimmer and boil the pretzels a few at a time for about 40 seconds. Lift them out and drain them well and place them on the parchment lined pans, at least 2 inches apart. 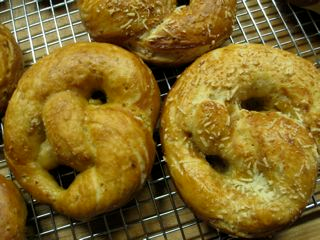 Brush the pretzels with the egg wash and sprinkle them with coarse salt and grated cheese. Bake until they are deep golden brown, about 15 minutes. Cool on racks. Best eaten warm. 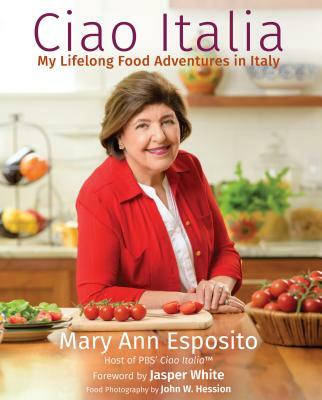 Dear Mary Ann, I have one question for you, When you make a Fritata, Do you put any Green Peppers or Cheese? Sammy, you can put anything you like into a frittata. But if you put in green peppers, you might want to saute them a bit before adding, as they are pungent. Cheese? Go for it! Asiago, fontina, are great cheeses.